Three different student groups visited the OBC last year: The Herpetology classes of the University of Costa Rica and Universidad Nacional led by professors Federico Bolaños and Marco Barquero, plus the Natural History and Zoology classes of the Universidad Latina, led by professor Luis Sandoval. 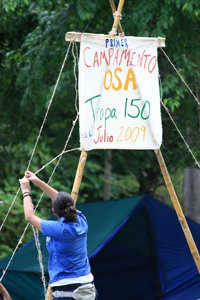 The Guides and Scouts of Puerto Jiménez, joined by a troop from Pérez Zeledón, went to the OBC to put in practice their camping skills for the first time, in an improvised camp set up by the children. A group of forestry engineers from the Cartago Technological Institute, in partnership with CATIE and the University of Connecticut, established a series of plots in the surroundings of the OBC to determine forest structure at different stages of succession and document carbon sequestration. Adrián García, working with bioacoustics in amphibians, has visited the OBC several times to record the songs of various species. His research is part of a project funded by an Evergreen grant. Stuart Jeckel, of the University of North Carolina, was in the OBC in search of the Túngara frog Engystomops pustulosus, as he is studying their breeding behavior at the neural level. Thank you so much for everything. Our time at the OBC was an absolutely amazing experience; we learned so much and met so many new, interesting people. It also was very helpful to me in realizing what I want to study in college, because I remembered how much I like plants and how interesting botany is for me. Thanks so much for everything you taught us! 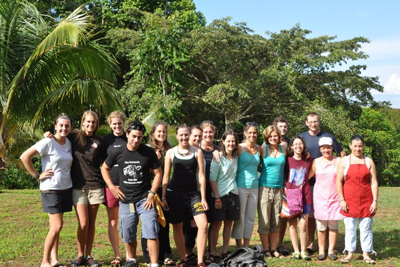 Karen Masters brought a student group to Cerro Osa for their Sustainability and the Environment course. They inaugurated the new camping platforms and composting latrines. This entry was posted in Science and Research, Volunteers and Visitors and tagged Amigos de la Osa, bioacoustics in amphibians, carbon sequestration, Centro de la Biodiversidad de Osa, Cerro Osa, Friends of the Osa, Herpetology, osa, Osa Biodiversity Center, Península de Osa, research, students, Túngara frog Engystomops pustulosus, visitors, Zoology. Bookmark the permalink.